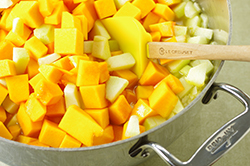 This fall-inspired soup comes together quickly when you use precut squash, available fresh in many supermarkets, and an immersion blender to blend the soup in the pot. 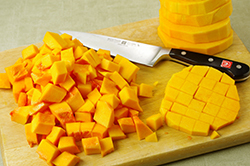 If you have a lot of squash, make a double batch of the soup and freeze for up to 3 months. 2. 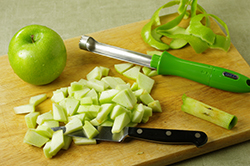 Add water, squash, apples, and nutmeg. Raise heat to high and bring to a boil. 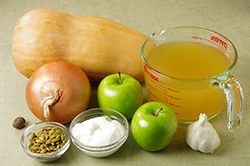 Reduce heat to maintain a simmer, cover, and cook, stirring occasionally, until squash is tender when pierced with a fork, about 20 minutes. 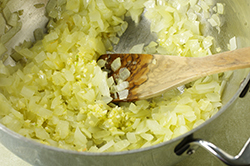 Remove from heat and let cool slightly. 3. 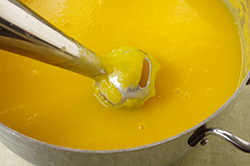 Using an immersion blender in the pot, purée soup until smooth. Or, transfer soup, in batches if necessary, to a blender or food processor and purée until smooth; return to pot and reheat if necessary. 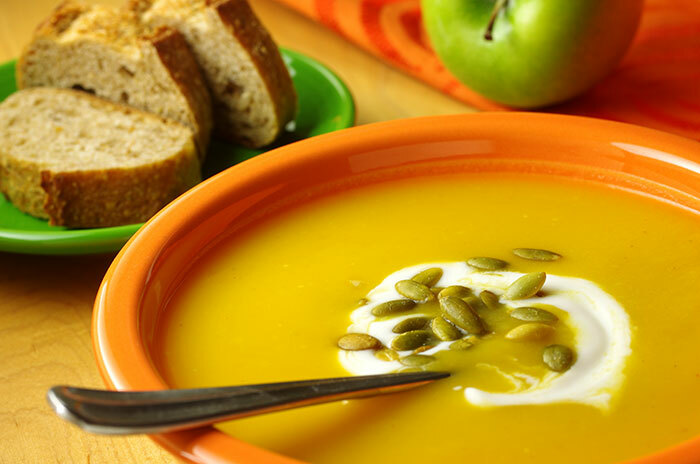 Ladle soup into bowls and top each serving with about 1 tablespoon yogurt and 1 teaspoon pumpkin seeds. Serve hot. Loaded with vitamins and minerals, this wholesome soup gets a topping of low-fat yogurt and energy-boosting seeds. Recipes from Healthy in a Hurry by Karen Ansel & Charity Ferreira. Published by Weldon Owen Publishing, San Francisco, CA. Copyright 2012. Reprinted with permission of the publisher. All rights reserved.